The physician inserts a needle and carefully guides it to the sympathetic nerves. The physician typically uses an x-ray device called a “fluoroscope”. 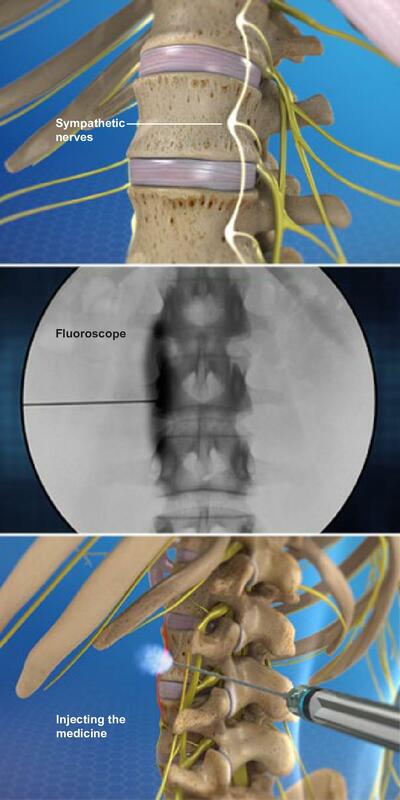 This shows a video image of the needle’s position. Contrast dye may be injected to help confirm that the needle is placed correctly. Next, the physician injects medicine. It bathes the nerves. It can numb the nerves and reduce inflammation. If these nerves have been a source of pain, the medicine can relieve it. The injection may also provide other benefits, depending on your needs. © 2015 Swarm Interactive, Inc.